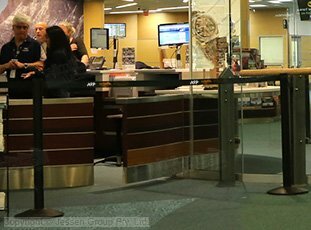 This retractable tape, like queue barriers, has custom designs printed in two colours onto a black woven nylon belt. Printing is done on both sides to maximise space and ensure visitors on either side can see your location name, whether at a bank, exhibition hall, retail store, airport, shopping centre, hotel, or casino. 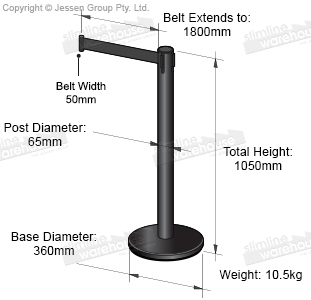 The 1.8m long belt is designed to easily attach to other posts or wall clips, and features a tamper-proof clip to help ensure the barricade remains in place. This retractable tape features a stainless steel post with a matte black finish that offers a sleek design with durability to last for years to come. 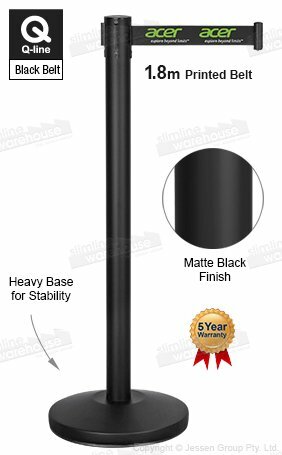 A weighted base with rubberised bottom ensures the post remains in place during use whilst preventing scratches to floors. The barrier belt post has a 4-way adapter to make attaching to other posts and clips easy when creating a queue or cordoning off an area. Set-up requires no additional tools and only minutes to complete! Click here to see our extensive online catalogue and the hundreds of products we are currently offering. Slimline Warehouse provides same day despatch to Gold Coast, Melbourne, Perth, Adelaide, Sydney, Canberra, Brisbane, & anywhere else in Australia with most in stock orders when paid for by 1pm EST!